↑ Paris, Bernard J. (1998) Horney & Humanistic Psychoanalysis – Personal History Archived May 23, 2011, at the Wayback Machine.. International Karen Horney Society. 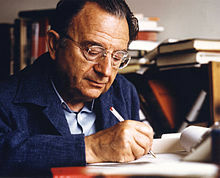 ↑ Fromm, E. (1966). You shall be as Gods, A Fawcett Premier Book, p. 18:"Hence, I wish to make my position clear at the outset. If I could define my position approximately, I would call it that of a nontheistic mysticism."